Anuradha marched into the police station to impress that death of two poor children was no less important than others. 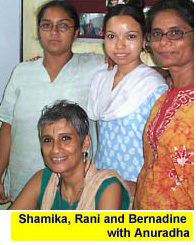 She meets with social activists and lawyers to pursue the poor's rights. She organises fund raisers and keeps exploring ways and means to make her project self sustaining. Problems pop-up on a daily basis. Cities are places where conflicts are endemic. Anuradha however will wrestle with every injustice, every sadness, explore every promise that crosses her path, bringing in a Western clarity and an Indian sensitivity. It's been worth it because Manu has begun to smile again. She says it means he has forgiven his tormentors. And wonders if life's purpose is to earn the forgiveness of the wronged ones. If that sounds too negative, how about it being an endeavour to enfold everyone into the picture? Anuradha says that but for the accident of that ancestor on S S Nimrod, she too would be out there battling life. She is now trying to arrange such happy accidents for the 500 under her care. As this article is being readied to go online, news comes of another achievement by Anuradha Bakhshi's Project Why. About two weeks ago, the poor parents of Raju in nearby Sanjay Nagar approached Anuradha for help: Raju was critically ill with defective valves in his heart. He would need surgery that would cost over a lakh rupees which the tea shop owning father can scarcely comprehend. What comes to Anuradha's table is seldom dismissed without the most sincere consideration. She spent a few days groping for ways to put the sum together. Then she decided to call upon her friends Prannoy and Radhika Roy of NDTV. They warmed to the story and ran it all of a day, starting late Sep 9. They added an appeal and cited Anuradha's phone number. Well, wonderful things do keep happening in India. Within 18 hours enough money poured in from all over the country. There is going to be a surplus even, after caring for Raju. Anuradha says she will park that in a growing fund to help other needy children. For GoodNewsIndia, the added excitement is the activist journalism by NDTV. Amidst a diet of nasties, we do need to believe that people's good instincts are not dead. Anuradha's doggedness, Raju's prospects and the outpouring of many well-intentioned Indians are the very stuff that civil societies are made of. And good journalism must give prominence to it. All donations to Sri Ram Goburdhun Charitable Trust are exempt under Section 80[G] of the Indian Income Tax Act 1961.